......looks like a great place for baseball. At least for the next 3 games. Sano could practice hitting Moon shots. It doesn't meet mlb standards. Specifically, down the right field line is too short. So, it would be about the same as old Yankee Stadium. Which wouldn't meet mlb standards. It would be kind of fun to go see one Twins game there, but.... no. Not happening. Reading this thread makes me think that I should go see a Gophers game there one of these years just for the experience of doing it. Same for a Saints game at CHS. Edited by Nine of twelve, 14 April 2018 - 12:57 PM. yeah It would be fun if they surprised everyone and were working on a one-time game at the Bank for tomorrow. * It is the peoples stadium, right? Maybe they can’t play a regulation game but it would be fun to see them scrimmage there, or practice. I hope they are warm enough (not trying to pun with the weather there, I mean warm enough in their baseball playing) and ready enough to play their games against Cleveland without having games for the last three days so early in the season. We could have used Miller Park in Milwaukee this weekend (the Brewers are on the road). I believe the Chicago Cubs & Cleveland once used Miller Park to play a make-up game. And Carlos Zambrano threw a dang no-hitter, too! Remember the Astros using Tropicana as their "home field" for a few games last year? Why shouldn't the Twins use US Bank for a game or two? This is a record-breakingly snowy April, it's not like they'd need to do this all the time. I am guessing though, that the Twins don't want to start a pattern. If they use US Bank once, every rainout, fans will say "Just use US Bank" and it'll cause problems they don't want to deal with. 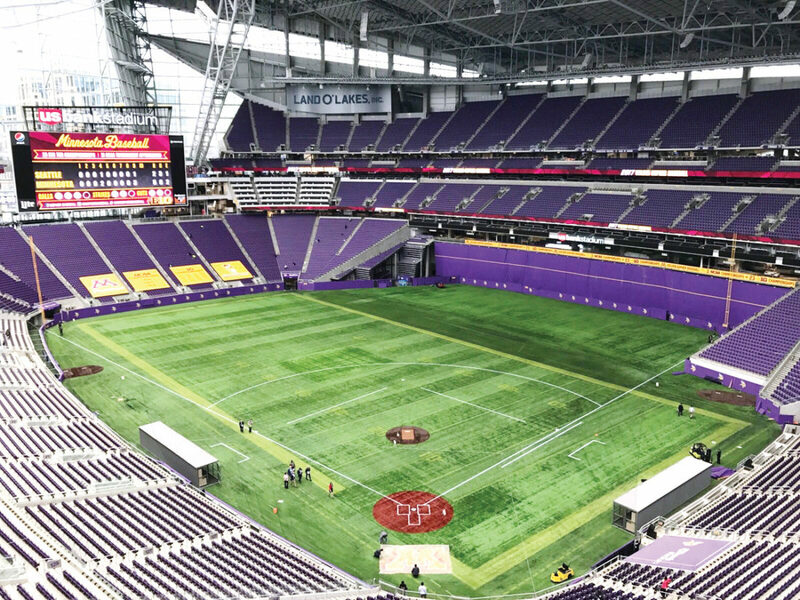 Vikings don't have control over what happens and doesn't happen in US Bank.That is governed by the Minnesota Sports Facilities Authority.So, if MLB and the Twins wanted to play a game at US bank, the Vikings wouldn't have anything to say about it. Having said that, as mentioned above, the baseball configuration does not meet MLB standards.It's fine and super convenient for college and high school, and in March and early April it is not unusual to have 4-5 games per day booked some days.I've gone to many such events/games at both the Metrodome and US Bank...although, the last games I went to at US Bank were last April, haven't gone this spring yet. The dimensions aren't great, and there are other factors as well.There are no dugouts...just 'cages' off to the side, similar to what you might see on a youth or municipal field.Also, there are no dirt areas surrounding the bases (at least as of last April)...dirt only around home plate (and the pitching mound)...so, in effect, no sliding area (although there was sliding) at either first, second, or third...which would be a non-starter right there for MLB.I'd post a picture if I could figure out how :(The configuration really doesn't look anything like what you see on the Stadium website. Unless the roof caves in. Bears a striking resemblance to another football stadium configured for baseball that we used to know and love. I have been there for several Gopher baseball games and yeah, it's not the greatest facility for baseball but considering we had the coldest game in Twins history a couple of weeks ago it is definitely more comfortable than that. One of the Gopher games I was at this spring was an afternoon game when it was sunny and it was nice. I've heard it's not going to be available next spring because of the Final Four so I will miss being able to get my baseball fix indoors in March. The concessions are horrible though - definitely eat before you go. And the seats are not very comfortable, the ones at Target Field are much better.